Many of you who are regular readers of my blog saw this post last month, about the tragic loss of my friend Chris Hertel. 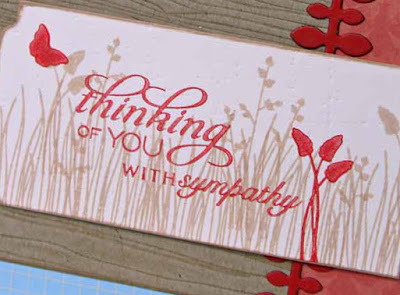 The card I'm sharing today is the sympathy card that I sent to Chris' family. It was probably the most difficult card I've ever had to make, both because I was unspeakably sad at the need for it, and also because I so wanted it to be absolutely perfect. I cut the strip from Vintage Cream with a Half and Half die, and then used PTI's Peaceful Garden on the focal point. I love the effect of layering the different images in a very light brown, and then adding the single foliage image in Terracotta Tile, as well as the little butterfly from Postmarks. The sentiment is a combination of Verve's Kind Words and PTI's Round and Round (3rd anniversary set). I added a strip of Damask Designs paper and a Leafy Vine die-cut border, after using the Woodgrain Impression Plate on the Kraft panel. The three gems are colored with a Copic to match the Spring Rain card base. Although this was a heartbreaking card to make, I found solace in thinking, "I think Chris would like this". I hope so. I miss her, and to her family - you continue to be in my thoughts and prayers each day. Debbie, this is absolutely beautiful! Oh I love this! Love the neutral stamping with just the pop of color.. So pretty! Oh Deb, I'm so sorry for the loss of your friend. Your card is absolutely beautiful, it has a very comforting feel to it! I love how you stamped the Half & Half die with the Peaceful Garden! Thoughts and prayer for your friend and her family. What a lovely card. You can tell a lot of thought went into it. I think peaceful garden is perfect for sympathy cards. I especially like how you continued the theme on the inside. Hugs to you on the loss of your friend. Beautiful card, Deb. Sympathy cards can be so hard to make. I am so sorry for the loss of your friend. This is a beautiful card, and I hope you can take some comfort in knowing that it is a card she would have loved. I'm going to case this idea for a sympathy card in the future. I am so sorry for the loss of your friend, I know she will appreciate a handmade, beautiful card. I love how beautifully this card flows together. Sympathy cards can be so difficult. Heaven knows I've made my fair share recently. You know what? I love that you put a little bit of sparkle on the card with the rhinestones. It's really, really pretty. I am so very sorry about the loss of your friend.